The unemployment rate is low, which is certainly good, and many commentators have noted it is now (at 3.7% in September and October, and an average of 3.9% so far this year) at the lowest the US has seen since the 1960s. The rate hit 3.4% in late 1968 and early 1969, and averaged about 3.5% in each of those years. But are those rates really comparable to what they are now? This is important, not simply for “bragging rights” (or, more seriously, for understanding what policies led to such rates), but also for understanding how much pressure such rates are creating in the labor market. The concern is that if the unemployment rate goes “too low”, labor will be able to demand a higher nominal wage and that this will then lead to higher price inflation. Thus the Fed monitors closely what is happening with the unemployment rate, and will start to raise interest rates to cool down the economy if it fears the unemployment rate is falling so low that there soon will be inflationary pressures. And indeed the Fed has, since 2016, started to raise interest rates (although only modestly so far, with the target federal funds rate up only 2.0% points from the exceptionally low rates it had been reduced to in response to the 2008/09 financial and economic collapse). A puzzle is why the unemployment rate, at just 3.9% this year, has not in fact led to greater pressures on wages and hence inflation. It is not because the modestly higher interest rates the Fed has set have led to a marked slowing down of the economy – real GDP grew by 3.0% in the most recent quarter over what it was a year before, in line with the pace of recent years. Nor are wages growing markedly faster now than what they did in recent years. Indeed, in real terms (after inflation), wages have been basically flat. What this blog post will explore is that the unemployment rate, at 3.9% this year, is not in fact directly comparable with the levels achieved some decades ago, as the composition of the labor force has changed markedly. The share of the labor force who have been to college is now much higher than it was in the 1960s. Also, the share of the labor force who are young is now much less than it was in the 1960s. And unemployment rates are now, and always have been, substantially less for those who have gone to college than for those who have not. Similarly, unemployment rates are far higher for the young, who have just entered the labor force, than they are for those of middle age. Because of these shifts in the shares, a given overall unemployment rate decades ago would only have happened had there been significantly lower unemployment rates for each of the groups (classified by age and education) than what we have now. The lower unemployment rates for each of the groups, in that period decades ago, would have been necessary to produce some low overall rate of unemployment, as groups who have always had a relatively higher rate of unemployment (the young and the less educated) accounted for a higher share of the labor force then. This is important, yet I have not seen any mention of the issue in the media. As we will see, the impact of this changing composition of the labor force on the overall unemployment has been significant. The chart at the top of this post shows what the overall unemployment rate would have been, had the composition of the labor force remained at what it was in 1970 (in terms of education level achieved for those aged 25 and above, plus for the share of youth in the labor force aged 16 to 24). For 2018 (through the end of the third quarter), the unemployment rate at the 1970 composition of the labor force would then have been 5.2% – substantially higher than the 3.9% with the current composition of the labor force. We will discuss below how these figures were derived. At 5.2%, pressures in the labor market for higher wages will be substantially less than what one might expect at 3.9%. This may explain the lack of such pressure seen so far in 2018 (and in recent years). Although commonly done, it is just too simplistic to compare the current unemployment rate to what it was decades ago, without taking into account the significant changes in the composition of the labor force since then. The rest of this blog post will first review this changing composition of the labor force – changes which have been substantial. There are some data issues, as the Bureau of Labor Statistics (the source of all the data used here) changed its categorization of the labor force by education level in 1992. Strictly speaking, this means that compositional shares before and after 1992 are not fully comparable. However, we will see that in practice the changes were not such as to lead to major differences in the calculation of what the overall unemployment rate would be. We will also look at what the unemployment rates have been for each of the groups in the labor force relative to the overall average. They have been remarkably steady and consistent, although with some interesting, but limited, trends. Finally, putting together the changing shares and the unemployment rates for each of the groups, one can calculate the figures for the chart at the top of this post, showing what the unemployment rates would have been over time, had the labor force composition not changed. The composition of the labor force has changed markedly in the US in the decades since World War II, as indeed it has around the world. More people have been going to college, rather than ending their formal education with high school. Furthermore, the post-war baby boom which first led (in the 1960s and 70s) to a bulge in the share of the adult labor force who were young, later led to a reduction in this share as the baby boomers aged. The changes in labor force composition are indeed large. The share of the labor force who have completed college (including those with an advanced degree) has more than tripled, from 11% of the labor force in 1970 to 35% in 2018. Those with some college have more than doubled, from 9% of the labor force to 23%. At the other end of the education range, those who have not completed high school fell from 28% of the labor force to just 6%, while those completing high school (and no more) fell from 30% of the labor force to 22%. And the share of youth in the labor force first rose from 19% in 1965 to a peak of 24 1/2% in 1978, and then fell by close to half to 13% in 2018. As we will see below, each of these groups has very different unemployment rates relative to each other. Unemployment rates are far less for those who have graduated from college than they are for those who have not completed high school, or for those 25 or older as compared to those younger. Comparisons over time of the overall unemployment rate which do not take this changing composition of the labor force into account can therefore be quite misleading. But first some explanatory notes on the data. (Those not interested in data issues can skip this and go directly to the next section below.) The figures were all calculated from data collected and published by the Bureau of Labor Statistics (BLS). The BLS asks, as part of its regular monthly survey of households, questions on who in the household is participating in the labor force, whether they are employed or unemployed, and what their formal education has been (as well as much else). From this one can calculate, both overall and for each group identified (such as by age or education) the figures on labor force shares and unemployment rates. A few definitions to keep in mind: Adults are considered to be those age 16 and above; to be employed means you worked the previous week (from when you were being surveyed) for at least one hour in a paying job; and to be unemployed means you were not employed but were actively searching for a job. The labor force would thus be the sum of those employed or unemployed, and the unemployment rate would be the number of unemployed in whatever group as a share of all those in the labor force in that group. Note also that full-time students, who are not also working in some part-time job, are not part of the labor force. Nor are those, of whatever age, who are not in a job nor seeking one. The education question in the survey asks, for each household member in the labor force, what was the “highest level of school” completed, or the “highest degree” received. However, the question has been worded this way only since 1992. Prior to 1992, going back to 1940 when they first started to ask about education, the question was phrased as the “highest grade or year of school” completed. The presumption was that if the person had gone to school for 12 years, that they had completed high school. And if 13 years that they had completed high school plus had a year at a college level. However, this presumption was not always correct. The respondent might only have completed high school after 13 years, having required an extra year. Thus the BLS (together with the Census Bureau, which asks similar questions in its surveys) changed the way the question was asked in 1992, to focus on the level of schooling completed rather than the number of years of formal schooling enrolled. For this reason, while all the data here comes from the BLS, the BLS does not make it easy to find the pre-1992 data. The data series available online all go back only to 1992. However, for the labor force shares by education category, as shown in the chart above, I was able to find the series under the old definitions in a BLS report on women in the labor force issued in 2015 (see Table 9, with figures that go back to 1970). But I have not been able to find a similar set of pre-1992 figures for unemployment rates for groups classified by education. Hence the curve in the chart at the top of this post on the unemployment rate holding constant the composition of the labor force could only start in 1992. Did the change in education definitions in 1992 make a significant difference for what we are calculating here? They will matter only to the extent that: 1) the shifts from one education category to another were large; and 2) the respective unemployment rates where there was a significant shift from one group to another were very different. As can be seen in the chart above, the only significant shifts in the trends in 1992 was a downward shift (of about 3% points) in the share of the labor force who had completed high school and nothing more, and a similar upward shift (relative to trend) in the share with some college. There are no noticeable shifts in the trends for the other groups. And as we will see below, the unemployment rates of the two groups with a shift (completed high school, vs. some college) are closer to each other than that for any other pairing of the different groups. Thus the impact on the calculated unemployment rate of the change in categorization in 1992 should be relatively small. And we will see below that that in fact is the case. There was also another, but more minor (in terms of impact), change in 1992. The BLS always reported the educational composition of the labor force only for those labor force members who were age 25 or above. However, prior to 1992 it reported the figures only for those up to age 64, while from 1992 onwards it reported the figure at any higher age if still in the labor force, including those who at age 65 or more but not yet retired. This was done as an increasing share over time of those in the US of age 65 or higher have remained in the labor force rather than retiring. However, the impact of this change will be small. First, the share of the labor force of age 65 or more is small. And second, this will matter only to the extent that the shares by education level differ between those still in the labor force who are age 65 or more, as compared to those in the labor force of ages 25 to 64. Those differences in education shares are probably not that large. As noted above, unemployment rates differ between groups depending on age and education. It should not be surprising that those who are young (ages 16 to 24) who are not in school but are seeking a job will experience a high rate of unemployment relative to those who are older (25 and above). They are just starting out, probably do not have as high an education level (they are not still in school), and lack experience. And that is indeed what we observe. At the other extreme we have those who have completed college and perhaps even hold an advanced degree (masters or doctorate). They are older, have better contacts, normally have skills that have been much in demand, and may have networks that function at a national rather than just local level. The labor market works much better for them, and one should expect their unemployment rate to be lower. The unemployment rates of each group vary substantially over time, in tune with the business cycle, but their position relative to each other is always the same. That is, the rates move together, where when one is high it will also be high for the others. This is as one would expect, as movements in unemployment rates are driven primarily by the macroeconomy, with all the rates moving up when aggregate demand falls to spark a recession, and moving down in a recovery. The unemployment rate for those just entering the labor force (ages 16 to 24) has always been about double what the overall unemployment rate was at the time. And it does not appear to be subject to any major trend, either up or down. Those in the labor force (and over age 25) with less than a high school degree (the curve in blue) also have experienced a higher rate of unemployment than the overall rate at the time – 40 to 60% higher. There might be some downward trend, but one cannot yet say whether it is significant. We need some more years of data. Those in the labor force with just a high school degree (the curve in green in the chart) have had an unemployment rate very close to the average, with some movement from below the average to just above it in recent years. Those with some college (in red) have remained below the overall average unemployment rate, although less so now than in the 1990s. 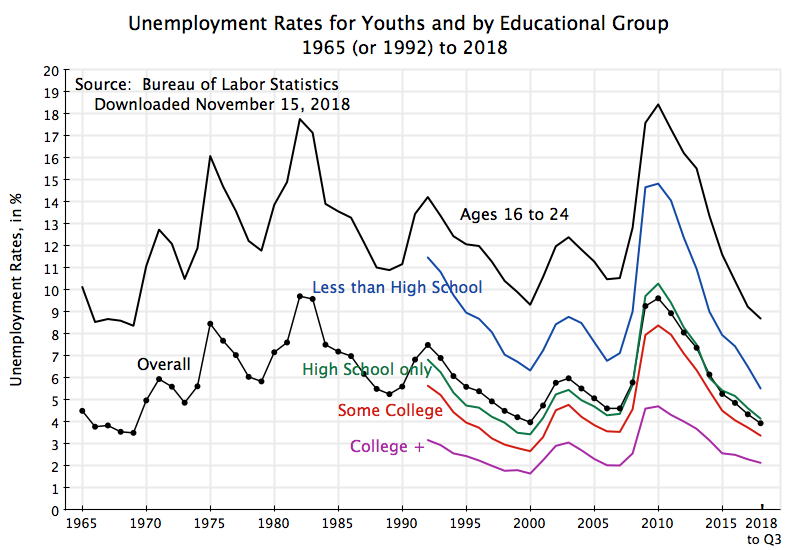 And those with a college degree or more (the curve in purple) have had an unemployment of between 60% below the average in the 1990s to about half now. There are probably a number of factors behind these trends, and it is not the purpose of this blog post to go into them. But I would note that these trends are consistent with what a simple supply and demand analysis would suggest. 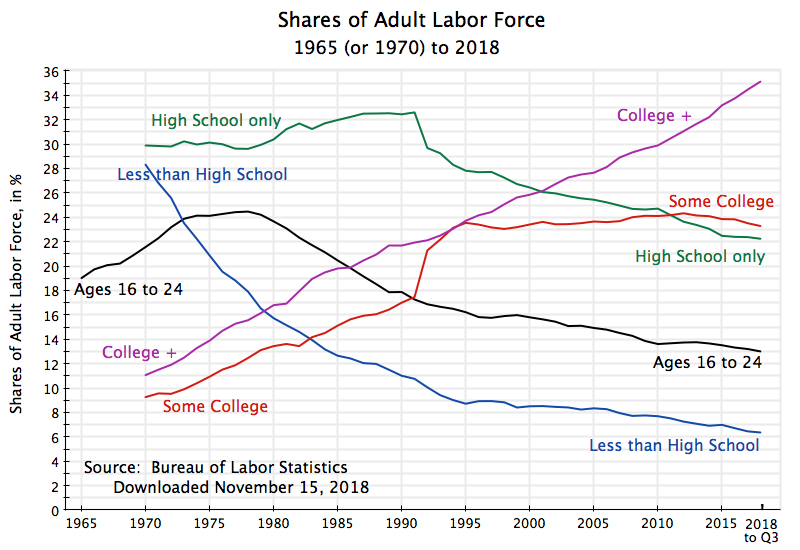 As seen in the chart in section B of this post, the share of the labor force with a college degree, for example, has risen steadily over time, to 35% of the labor force now from 22% in 1992. With that much greater supply and share of the labor force, the advantage (in terms of a lower rate of unemployment relative to that of others) can be expected to have diminished. And we see that. But what I find surprising is that that impact has been as small as it has. These ratios have been remarkably steady over the 27 years for which we have data, and those 27 years have included multiple cycles of boom and bust. And with those ratios markedly different for the different groups, the composition of the labor force will matter a great deal for the overall unemployment rate. As noted above, those in the labor force who are not young, or who have achieved a higher level of formal education, have unemployment rates which are consistently below those who are young or who have less formal education. Their labor markets differ. A middle-aged engineer will be considered for jobs across the nation, while someone with who is just a high school graduate likely will not. Secondly, when we say the economy is at “full employment” there will still be some degree of unemployment. It will never be at zero, as workers may be in transition between jobs and face varying degrees of difficulty in finding a new job. But this degree of “frictional unemployment” (as economists call it) will vary, as just noted above, depending on age (prior experience in the labor force) and education. Hence the “full employment rate of unemployment” (which may sound like an oxymoron, but isn’t) will vary depending on the composition of the labor force. And more broadly and generally, the interpretation given to any level of unemployment needs to take into account that compositional structure of the labor force, as certain groups will consistently experience a higher or lower rate of unemployment than others, as seen in the chart above. Thus it is misleading simply to compare overall unemployment rates across long periods of time, as the compositional structure of the labor force has changed greatly over time. Such simple comparisons of the overall rate may be easy to do, but to understand critical issues (such as how close are we to such a low rate of unemployment that there will be inflationary pressure in the labor market), we should control for labor force composition. The blue line shows the unemployment rate for the labor force since 1965, as conventionally presented. The red line shows, in contrast, what the unemployment rate would have been had the unemployment rate for each identified group been whatever it was in each year, but with the labor force composition remaining at what it was in 1970. 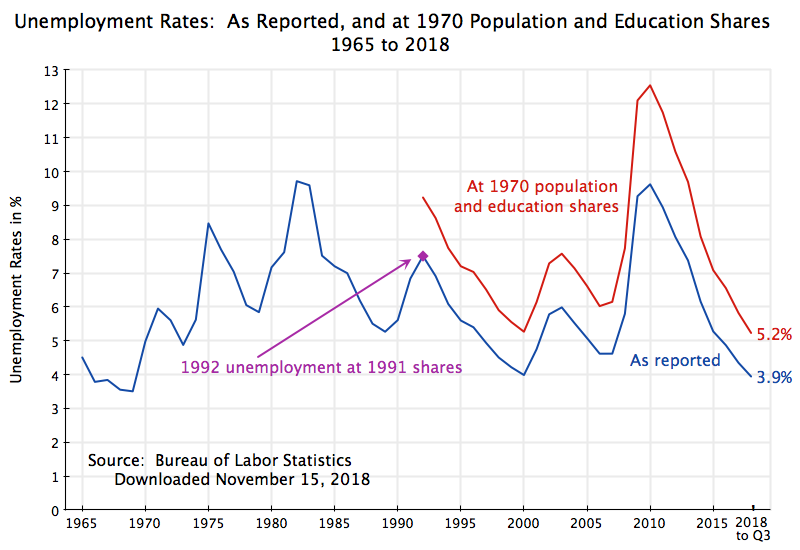 The red line is a simple weighted average of the unemployment rates of each group, using as weights what their shares would have been had they remained at the shares of 1970. The labor force structure of 1970 was taken for this exercise both because it is the earliest year for which I could find the necessary data, and because 1970 is close to 1968 and 1969, when the unemployment rate was at the lowest it has been in the last 60 years. And the red curve can only start in 1992 because that is the earliest year for which I could find unemployment rates by education category. The difference is significant. And while perhaps difficult to tell from just looking at the chart, the difference has grown over time. In 1992, the overall unemployment rate (with all else equal) at the 1970 compositional shares, would have been 23% higher. By 2018, it would have grown to 33% higher. 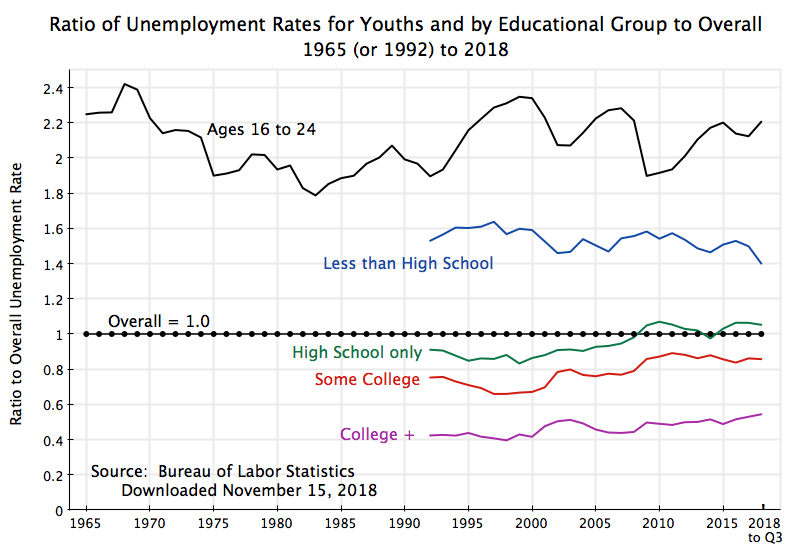 Note also that, had we had the data going back to 1970 for the unemployment rates by education category, the blue and red curves would have met at that point and then started to diverge as the labor force composition changed. Also, the change in 1992 in the definitions used by the BLS for classifying the labor force by education did not have a significant effect. For 1992, we can calculate what the unemployment rate would have been using what the compositional shares were in 1991 under the old classification system. The 1991 shares for the labor force composition would have been very close to what they would have been in 1992, had the BLS kept the old system, as labor force shares change only gradually over time. That unemployment rate, using the former system of compositional shares but at the 1992 unemployment rates for each of the groups as defined under the then new BLS system of education categories, was almost identical to the unemployment rate in that year: 7.6% instead of 7.5%. It made almost no difference. The point is shown in purple on the chart, and is almost indistinguishable from the point on the blue curve. And both are far from what the unemployment rate would have been in that year at the 1970 compositional weights (9.2%). The structure of the labor force has changed markedly in the post-World War II period in the US, with a far greater share of the labor force now enjoying a higher level of formal education than we had decades ago, and also a significantly lower share who are young and just starting in the labor force. Since unemployment rates vary systematically by such groups relative to each other, one needs to take into account the changing composition of the labor force when making comparisons over time. This is not commonly done. The unemployment rate has come down in 2018, averaging 3.9% so far and reaching 3.7% in September and October. It is now below the 3.8% rate it hit in 2000, and is at the lowest seen since 1969, when it hit 3.4% for several months. But it is misleading to make such simple comparisons as the composition of the labor force has changed markedly over time. At the 1970 labor force shares, the unemployment rate in 2018 would have been 5.2%, not 3.9%. And at a 5.2% rate, the inflationary pressures expected with an exceptionally low unemployment rate will not be as strong. This may, at least in part, explain why we have not seen such inflationary pressures grow this past year.